Do you need a midnight, mid-afternoon or mid-run snack to get through the day? We know we do. Let's face it: three square meals are no match for your appetite. The good news is that eating small meals throughout the day not only silences your grumbling stomach, but can also aid in weight loss. From soybeans to gummy bears (yes, really), we've got 25 runner-friendly foods that can be eaten (in snack size) whenever hunger comes knocking. When they're good: Before, during, or after exercise. They're great blended into a fruit smoothie. Or simply whip frozen banana chunks with milk in a blender for an awesome recovery shake. 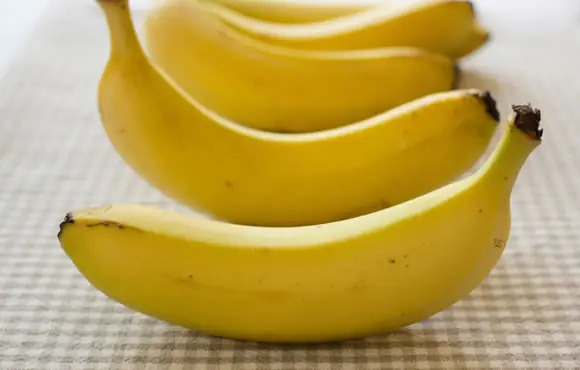 Calories: 105 per medium-sized banana. Why they're good: Carrots are low-calorie but filling, so they're excellent if you're watching your weight. They contain carotene and vitamin A, which promote eye health and strong immune function. When they're good: Eat them at night when you want something to munch but don't want extra calories. Or eat them before dinner if you're famished. This way, you won't overindulge once you sit down for your meal. Calories: 30 to 40 per medium-sized carrot. Related: 18 Surprising Reasons Your Weight Loss Plan Isn't Working? Why it's good: Most cereals are vitamin- and mineral-fortified, and they're great with fresh fruit sliced on top. Cereal is a quick-to-prepare, easily digestible, and healthful way to satisfy your sweet tooth. (Even some sweetened cereals are a good low-fat alternative to cookies). Choose cereals that have 5 grams of fiber or more per serving. When it's good: Fine as a pre-run snack, a post-run pick-me-up, or even as a trail mix during a long, easy run. Calories: Between 200 and 500 (per 11/2 ounces of cereal plus 8 ounces of skim milk). Nutrition Tip: A good goal is to eat six meals spread over 16 waking hours—about one every three hours. Why it's good: Chocolate milk is cold and helps keep you hydrated. It also provides plenty of protein, carbohydrates, and B vitamins. The calcium in milk will help keep your bones strong. When it's good: An ice-cold shot of chocolate milk is the perfect reward after a hot summer run. Calories: 160 calories per 8 ounces of 1 percent milk. Why it's good: It's packed with protein, which runners need more of than sedentary people for muscle rebuilding and repair. It serves as a good calcium source as well. When it's good: Any time except just before running. Great with fruit after an intense workout or race. Calories: 165 per 1 cup of 1 percent cottage cheese. Why they're good: These little morsels are low-fat and high-carbohydrate, and provide a good amount of vitamin A, fiber, and potassium. When they're good: Any time. Toss chopped apricots over your granola at breakfast, or eat whole ones plain before your afternoon workout or as a sweet treat after dinner. Calories: 80 per 10 apricot halves. Why they're good: Dried plums contain no fat and are packed with carbohydrates. They're also a good source of fiber and potassium. Eating potassium-rich foods like dried plums helps lower high blood pressure. When they're good: Dried plums make a healthful snack almost any time. But don't eat them just before your run, as they can act as a laxative. Calories: 100 per five dried plums. Why they're good: They're designed especially for runners, and you can choose from high-carb, 40/30/30, or protein-plus bars. They're tasty and come in all flavors. When they're good: Pre race, mid-marathon or post-race. Calories: 200 to 300 per 2.4- or 2.75-ounce bar. Nutrition Tip: Eat when you know you're going to use the calories. Remember, not all calories are created equal. Find out the surprising truth about calories. Why they're good: These pizzas include three food groups—grain, dairy, and vegetable—and supply protein, calcium, and beta-carotene. All are important for strong bones. When they're good: Eat any time after running or as an afternoon snack to keep you energized for your evening run. Why they're good: Chewy fig bar cookies are a tasty, convenient source of carbohydrates and fiber. They are carbs that are quickly digestible, making them great on-the-go snacks. When they're good: Any time, even during the middle of a marathon when you need to refuel in a hurry. Of course, if you're fiber-sensitive, save them until after the race. Calories: 110 per 2 cookies. Why they're good: This refreshing low-calorie treat is loaded with vitamin C, which fortifies your immune system and helps boost iron absorption. When they're good: They're great any time, but they're best immediately after a tough, hot run. Calories: 75 per 3-ounce frozen fruit/juice bar. Why it's good: Yogurt is a great source of calcium, protein, and potassium, plus it's low in fat and fairly high in carbohydrates. The live and active cultures in yogurt will boost your immune system. When it's good: Any time. Some runners swear by it as a highly digestible prerace snack, despite its protein content. Calories: 250 per 8 ounces of low-fat yogurt. Why they're good: A low-calorie granola bar will satisfy your sweet cravings, without the fat calories of a candy bar. And unlike candy bars, granola bars come with B vitamins and iron. When they're good: Any time you feel like satisfying your sweet tooth without feeling guilty. Calories: 110 per 1-ounce bar. Why they're good: Soybeans in any form are a high-quality source of protein, iron, B vitamins, and heart-healthy isoflavones (which boost bone health). Soy protein has been shown to lower the risk of heart disease and cancer. When they're good: Eat them after your workout, or as a low-calorie but filling afternoon snack. Calories: 125 per 1?2 cup raw or boiled. Why it's good: This filling snack packs plenty of protein, fiber, vitamin B6, and folic acid. The latter is especially important for a healthy pregnancy and has recently been shown to prevent anemia and breast cancer. When it's good: Hummus works well as a substantial midmorning or afternoon snack. It's also a more healthful evening alternative to peanuts or other fried party snacks. Calories: 280 per 3 tablespoons of hummus and eight wheat crackers. 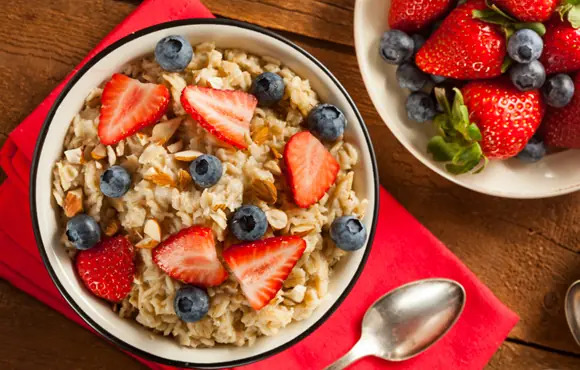 Why it's good: Studies show oatmeal helps lower cholesterol. Oatmeal will also fill you with plenty of carbohydrates to boost energy and alertness. When it's good: An excellent prerace food, or any time you wake up feeling hungry and ready for a hearty breakfast. Calories: 150 per 1?2 cup. Why they're good: Rice cakes are low in calories, most of which come from energizing carbohydrates. Peanut butter is an excellent source of protein and heart-healthy polyunsaturated and monounsaturated fat. It also contains vitamin E, which helps with muscle recovery. When they're good: A perfect stick-to-your-ribs snack for mid-morning or mid-afternoon. Calories: 225 per one rice cake with 2 tablespoons of peanut butter. Why they're good: If you use fruit and soy milk, smoothies are an easy way to consume a healthful dose of fiber and soy. Smoothies also furnish plenty of vitamins C and A, plus potassium, fiber, and calcium. When they're good: A cooling summer treat, a smoothie works well for breakfast, before a run, or as a refreshing, reenergizing, post-run treat. Calories: Approximately 200 per 12 ounces. Why it's good: Many runners fail to meet their calcium requirement, especially those who don't eat many dairy products. String cheese is a tasty, convenient way to take in calcium and protein as well as some fat. When it's good: Have a stick or two with some high-carbohydrate foods after a long run or race. Research shows that eating a little protein along with carbohydrates can speed your recovery. Calories: 80 per 1-ounce stick. Why it's good: Bean tortillas are high in protein and folic acid and also provide calcium, phosphorous, iron, and zinc. To make this snack even lower in fat, you can substitute a whole-grain tortilla, fat-free refried beans, and a soy-based, fat-free cheese substitute. When it's good: As a substantive, post-run snack or light meal. Calories: 310 per 8-ounce flour tortilla, 2 tablespoons salsa, 1-ounce part-skim mozzarella cheese and 1?2 cup refried beans. Why it's good: Tuna comes with protein and heart-healthy omega-3 fats. Research shows that men who eat at least 3 to 4 ounces of fish per week are less likely to die of a heart attack, and that women who eat at least two servings of fish per week reduce their risk of rheumatoid arthritis. When it's good: Perfect for lunch or an afternoon snack. Consider a tuna salad with low-fat mayo and sliced tomatoes. Calories: 110 per 3 ounces, canned in water. Trust us on the next four. At first glance, these four treats may seem like junk food, but they're not. Each provides tangible benefits for runners, so enjoy them guilt-free. Not a fan of tuna? Here are 5 cheap and healthy canned fish options to try, instead. These fun, tasty, fat-free snacks are easily digested and provide a quick hit of carbohydrates. Many runners swear by Gummy Bears when they need a quick pick-me-up on long runs or during marathons. And try a few on those afternoons when your energy sags. Calories: 130 per 1.4-ounce packet. Nutrition Tip: After exercise, even if you have no appetite, get something in your stomach. This snack is high in carbohydrates and vitamin-fortified. Plus, it's inexpensive, needs no preparation, and travels well in a gym bag. One Pop Tart will start your engine if you're a morning runner and provide a noticeable energy boost after a depleting workout. Unbuttered or slightly buttered popcorn is low in calories (mostly from carbohydrates), yet filling. It's perfect when you crave a salty food but don't want many calories. Plus, there are so many ways to make popcorn more fun without sabotaging your diet. Calories: 80 to 100 calories per 2 cups (popped). Check out our video for 2 DIY Popcorn Recipes. Like popcorn, pretzels are a low-calorie carbohydrate treat. Even the salty kinds are okay for runners who don't have high blood pressure, as they'll help you replace the sodium you lose through sweating. They're excellent as an afternoon snack. Calories: 110 per 1-ounce serving. Beat the afternoon slump with these natural boosters.